Law School Lowdown, Published | Scott Legal, P.C. If you’re a law school student, or if you’re planning to apply to law school, you’ll find the practical guidance you’ll need for success–plus tips on pitfalls to avoid–when you open this important new book. Written by a recent Harvard Law School graduate who worked with major Wall Street law firm, this brand-new blueprint for legal accomplishment gets down to specifics with that will help you succeed in law school. Law School Lowdown is now available to order! Just click here or on the image! Valuable appendices give you still more advice, and include a completed model law school application form, effective résumés, a model brief of a case for class, and much more. Written by a successful attorney and based on his own law school experiences, Law School Lowdown zeroes-in on both the rigors and satisfactions that comprise the law school experience, offering the advice and counsel that will pave your way to a successful career in law. 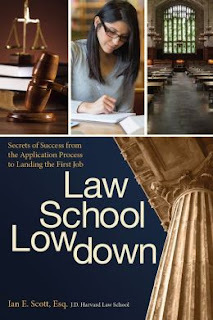 Written by a successful attorney and based on his own experiences, The Law School Lowdown focuses on both the difficulties and satisfactions that comprise the law school experience, offering advice and counsel that will pave the way to a successful law career. Order now by clicking the below link! Order Law School Lowdown Today!